Dr. Sarkissian has previously commented on certain signs warning parents or dentists of an existing tooth crowding in children between the ages of 7-9. 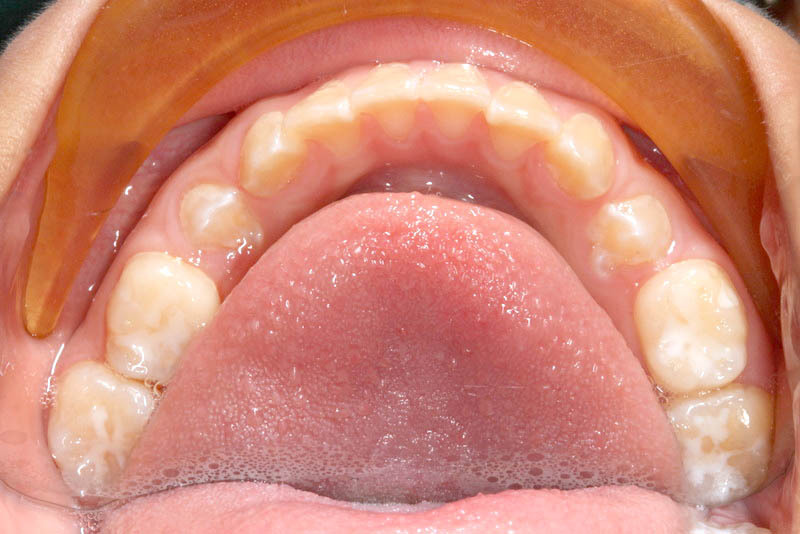 In this showcase, one of the main signs that presents itself and is very easy to detect by parents, is the crowded position and appearance of the UPPER LATERAL INCISOR. If by age of 7 these teeth come in crowded, rotated or slanted, it is a sure sign of future crowding. 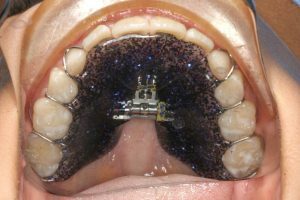 If Jaw orthopedics and arch development is not initiated at this stage, it will become MUCH MORE DIFFICULT to address this after age 13, when traditionally most children receive their braces. 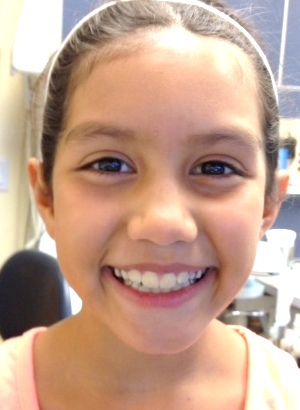 The growth potential of the jaws is still in full swing at age 8. 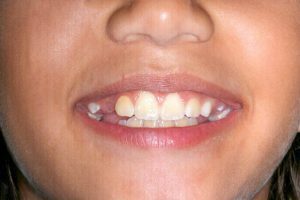 However, 90% of jaw growth is completed by age 13. Therefore it is logical to complete orthopedic therapy during the growth phase of a child. 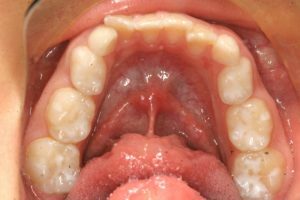 Since the child still has the primary molars until age 10, it is possible to use removable appliances. 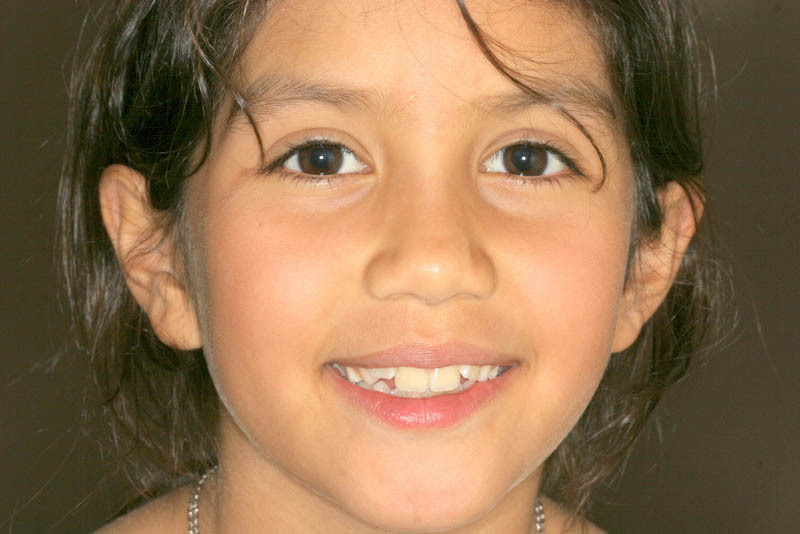 You can read more on jaw development principles, at Orthodontics – Early Intervention. 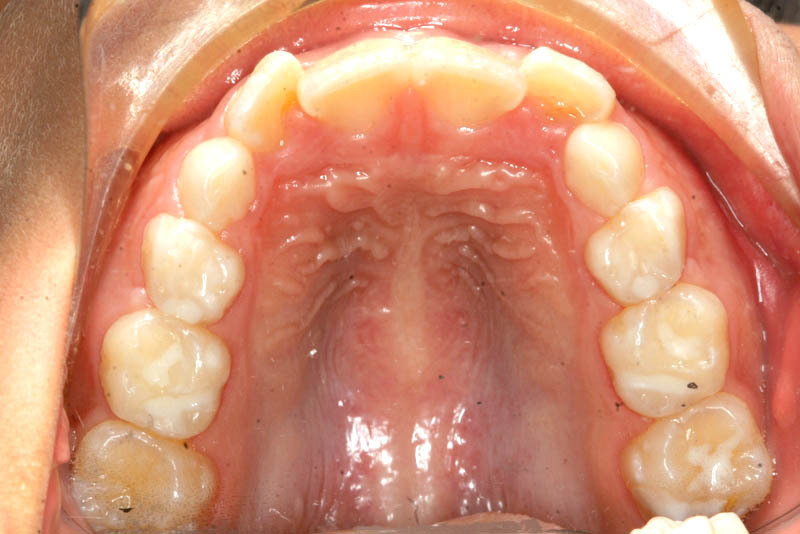 Between 8 and 10 all upper and lower incisors are present. Here we see typical crowding of the laterals. They simply have no space to come in and are rotated and displaced. This child will definitely suffer from crowding as she grows. 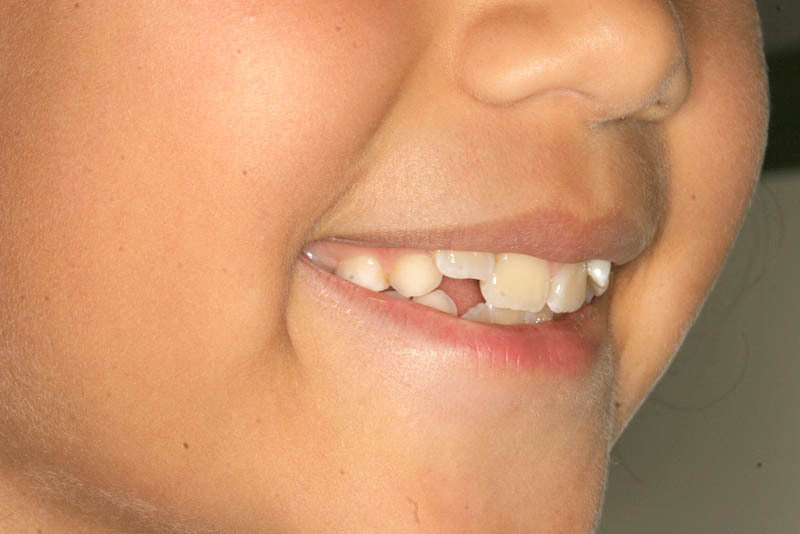 Contrary to many parents’ belief, children DO NOT OUTGROW tooth crowding. This condition with the crowded laterals is clearly visible in the smiling child. 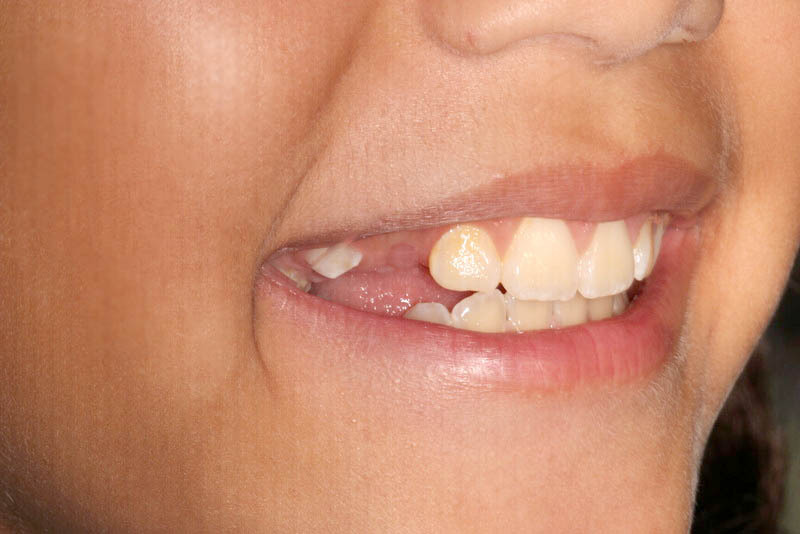 It is very easy to detect and for parents to initiate a consultation with a dentist experienced in jaw orthopedics. It is obvious from this angle that the width of the laterals and the available space for them is off. 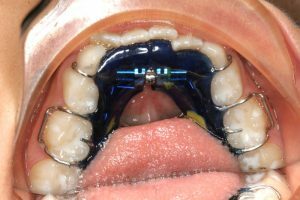 One basic appliance Dr. Sarkissian likes to use is called a “SCHWARTZ” expander. 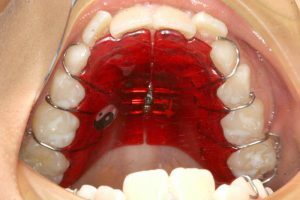 It is a removable arch development appliance. Each one may be in active use for 5-7 months. After 5 months, we switched to a similar appliance which is called a 3-way expander, which helps to flare the front segment of the jawbone and teeth at the same time as providing additional sideways expansion. 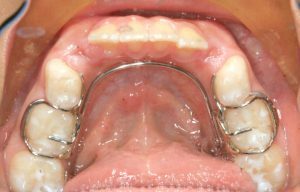 The second appliance for the lower teeth is called a “CROZAT” and is used to continue some jaw expansion and act as a retainer until the baby molars start to loosen. 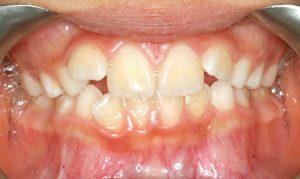 As soon as the permanent premolars appear after age 10, the appliances are discontinued to allow for all teeth to settle. The smile is already wide and beautiful, and fills the face. The laterals are straighter and seem to fit in their space. The jaws are significantly wider as these photographs attest. 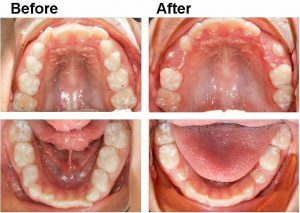 As soon as the permanent premolars appear after age 10, the appliances are discontinued to allow for all teeth to settle. At this point we have solved the foundation issue. In other words we have created jawbone dimensions to allow for all teeth to come in without crowding. After a year or two, as all remaining canines and premolars come in, and they come in straight, nothing else needs to be done. In case these teeth come in crooked or rotated, however, only then will braces (or partial braces) be needed. In such a case, it will only take LESS THAN A YEAR to align the teeth, as the jawbone foundation is already developed. 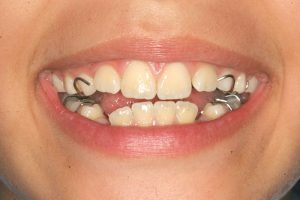 After properly creating the jaw dimension for all to come in without crowding, what we get after a few years is – – a beautiful smile!